Lock in a great price for Pousada Galeria Artes – rated 8.9 by recent guests! Friendly and helpful staff. Good breakfast. Flexible with starting it early if you had an early start for a tour. Clean comfortable rooms, comfortable beds, nice pool and garden. Small restaurant/bar on site. Excellent restaurants in town - 1km walk. Tour agency in the pousada was excellent. Incredible hospitality. Beautiful property. Fantastic breakfast. Maria is one of the most lovely souls we've ever met. Really nice breakfast, clean rooms, superfriendly owner. You can book all tours etc on site. Great service, travel recommendations to other spots, Maria was unbelievable friendly!!! Want to recommend that place to everyone! Maria, the owner, went out of her way to make our stay special. Lucia at the onsite travel office was awesome with getting everything booked for us. Breakfast was also fantastic! O quarto tem um tamanho bom. Tem espaço externo com um varal pra secar toalhas e roupas, o que é muito bom. O banheiro é bem limpo e espaçoso, achei de muito bom gosto. O atendimento é acolhedor e bem atencioso. O fato de ter a agência de turismo dentro do hotel facilita bastante. O local é bem tranquilo, mesmo em alta temporada. Achei tudo perfeito! Desde nossa chegada, permanência e saída, tudo perfeito! A equipe toda é maravilhosa, pousada aconchegante, quarto limpinho, roupas de cama e banho cheirosas. Lugar incrível! Café da manhã maravilhoso! Gratidão! 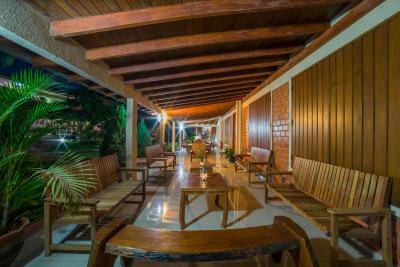 At just 2,800 feet from Bonito’s center, Galeria Artes features an outdoor swimming pool, a beautiful green garden with hammocks and parasols. This nonsmoking hotel includes buffet breakfast. Wi-Fi and private parking are free. The rooms offer a bright atmosphere with framed pictures of local surroundings. All feature air-conditioning and LED TV and a private bathroom with shower. Environmentally friendly, Pousada Galeria Artes displays a new art collection every semester, and features a TV room with stereo, games and magazines. 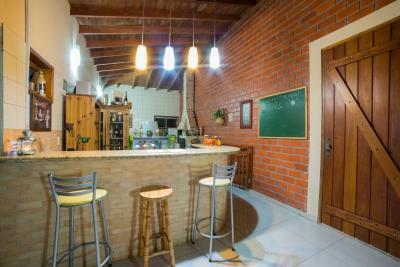 The property also offers a tour-agency and can arrange activities and entertainment in Bonito. Bonito Convention Center is 2.1 mi away, and the Central Bus Station is just 1,650 feet from the hotel. The Boa Project (Projeto Jiboia) is in a walking distance (1-2 minutes). This property is also rated for the best value in Bonito! Guests are getting more for their money when compared to other properties in this city. 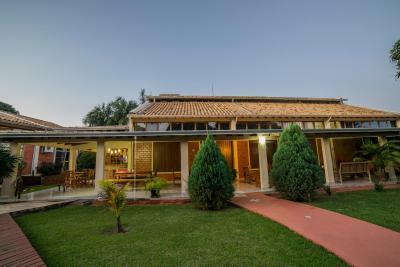 When would you like to stay at Pousada Galeria Artes? A spacious double room with a balcony and a private bathroom. This spacious room provides a private bathroom, 2 single beds and 1 king-size bed. This room is air-conditioned and has a solar-powered shower and a small terrace on the back. It features 1 double and 1 single bed. House Rules Pousada Galeria Artes takes special requests – add in the next step! One child under 12 years is charged BRL 100 per night when using existing beds. All children under 12 years are charged BRL 100 per night for extra beds. Any additional older children or adults are charged BRL 100 per night for extra beds. Pousada Galeria Artes accepts these cards and reserves the right to temporarily hold an amount prior to arrival. Please inform Pousada Galeria Artes of your expected arrival time in advance. You can use the Special Requests box when booking, or contact the property directly using the contact details in your confirmation. The only disappointment was they cleaned the pool on one of the days and it took a very long time, so we didn't get to use the pool much. I would suggest they clean the pool in the morning rather than after lunch when guest return from their day and would like to use it. Everything was wonderful except for we were slightly surprised that they had no balcony rooms as that is what was said we would get includes with our room. Having said this we were won over very quickly by the atmosphere and staff. What a wonderful holiday! the water heater is not very good. some times don't have hot water . We only ate dinner there once; going into town is a better choice.